Video: What Senator Wasserburger DOESN’T Want You to Know About His Record! If you talked to him about it, Senator William Wasserburger would tell you what a pro-gun lawmaker he is, someone who fights for the Second Amendment. The truth is much different. In fact, William Wasserburger almost ALWAYS votes to weaken, undermine, or flat out oppose your right to keep and bear arms! 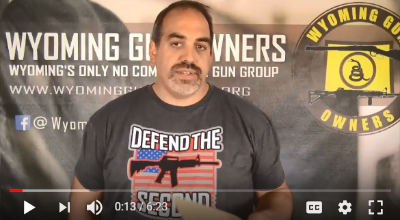 Instead, check out the video update that we’ve produced for gun owners in this district filled with dates, bill numbers, amendment numbers and much more! You see, facts matter, and we believe that gun owners should have all of them as they compare Jeff Raney vs William Wasserburger before the primary that is taking place in just two days! You can watch out video update here. First, become a member of Wyoming Gun Owners right away! Second, make sure that you ‘Like Us’ on our Facebook page, for up to the minute updates! Third, get the latest about other races by checking out the results of our candidate survey program, here! There is so much at stake in the fight for the Second Amendment in Cheyenne as we work to end ‘Gun Free Zones,’ that we can’t take anything for granted! P.S. Senator William Wasserburger would like to keep the truth about his record of voting against your gun rights under wraps! But the truth is that Wasserburger has consistently voted to weaken and undermine your gun rights and often simply votes ‘NO’ to pro-gun bills! To get all the facts about Wasserburger’s record, watch our video update here. And if you are not a member of Wyoming Gun Owners, please join up TODAY! Who Will Fight for Gun Owners in Senate District 21? Holding Rep. Patrick Sweeney Accountable in Casper!